This study was undertaken to evaluate hydrophilic antitumor agents administered in intraarterial (IA) infusions. Brain distributions of doxorubicin (Adriamycin, ADR) after IA infusions were determined in rabbit VX-2 brain tumor model. With right carotid infusions of ADR (8 rabbits), tumor center concentrations averaged 3.3 ± 1.42 μg/g (mean ± 1 SE), concentrations at least 100 times greater than in vitro inhibitory concentrations (IC50) of ADR for human gliomas. ADR concentrations in brain-around-tumor averaged 2.43 ± 0.81 μg/g, but were only 0.104 ± 0.019 μg/g in non-tumor-bearing hemisphere. In 15 rabbits with VX-2 brain tumors, carotid artery infusions of ADR increased mean survival times by 20.9 ± 8.3%. 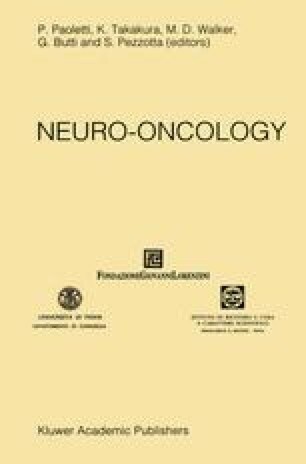 These findings are supported by animal study using IA infusions of ADR after hyperosmotic blood-brain barrier (BBB) disruption and study in brain tumor patients using IA infusions of ADR. These results show that significant amounts of relatively non-lipophilic drugs, with IA infusions, can penetrate brain tumor areas but still spare normal areas from toxic drug exposure. 1.Department of NeurosurgeryThe Cleveland Clinic FoundationClevelandU.S.A.